Editor's note: Business Traveller is a monthly show about making the most of doing business on the road. (CNN) -- The aviation sector is renowned as a carbon intensive business, but an increasing number of airports are looking to change that by integrating the latest green-tech into their daily operations. Air travel and transport accounts for two percent of all human generated greenhouse gas emissions, according to the Intergovernmental Panel on Climate Change (IPCC) -- with airports contributing five percent to the overall aviation figure. By adapting clean energy policies and technologies, eco-conscious airport operators hope to make a dent in these numbers and boost the industry's environmental street-cred. "We are making our airports greener, while balancing the tremendous economic impacts they deliver for our region," says Amy Malick, deputy commissioner of sustainability for the Chicago Department of Aviation (CDA), which will host the fifth annual Airports Going Green conference this November. "(We are) committed to implementing sustainable initiatives at our airports that enhance the quality of life for citizens," she adds. See also: Who are the U.S. and Europe's greenest airlines? Malick highlights how the CDA has installed over 230,000 square feet of vegetated roof space at Chicago O'Hare and Medway International Airport, ensured all Chicago airport trucks are fueled with ultra-low sulfur diesel gas and insisted recycled materials are utilized in all airports when possible. As a result, the CDA has saved 76,000 tons of CO2 from being pumped out by Chicago's airports alone, she claims. "Generally, whoever you are in business, you are looking to become more corporate friendly and environmentally aware," Surgenor says. "It (also) makes financial sense in the way that if you have a more efficiently run airport you will save money over time," he adds. "Not that they're (green airport initiatives) inherently a bad thing, but it's a waste of time when there are increasingly more flights and when airports are expanding," says Joe Ryle of UK based anti-aviation expansion group, Plane Stupid. "It's basically green-washing at its most obvious. 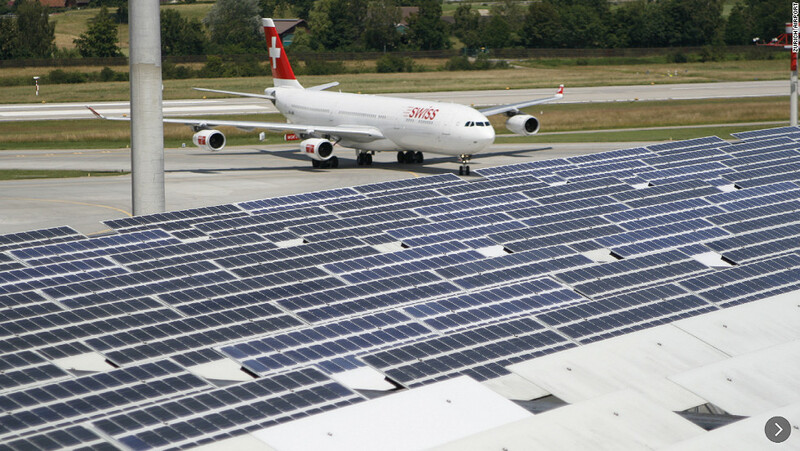 When aviation industry people talk about greener planes and greener airports having solar panels it's ultimately just a way for them to draw attention away from the rise in carbon polluting flights," he adds. But she firmly believes this shouldn't deter or stop airports across the globe from coming up with innovative new ways to cut or offset their emissions. "That is a danger, but "green-washing" is not the case in Chicago," she says. "We are not alone in this effort and will continue to be joined by airports around the world," she adds. Click on the gallery at the top of the page to see how airports around the world are reducing their carbon emissions and becoming more energy efficient.